… Much the same happened elsewhere, according to a review of taxpayer data by the National Bureau of Economic Research. “For every dollar that was brought back, there were zero cents used for additional capital expenditures, research and development, or hiring and employees’ wages,” said Kristin J. Forbes, a professor of economics at the Massachusetts Institute of Technology’s Sloan School of Management. Forbes was a member of President Bush’s Council of Economic Advisers and led the study. It seems likely, however, that U.S. corporations would respond to this idea by continuing their strike. Capital is global today, and not only wealthy, but politically powerful. Organized labor, like most democratic organizations, is local or national, and at a disadvantage. While corporate globalization hits manufacturing workers first, the resulting shift in wealth and power eventually affects service and government workers, and their unions, as well. Capital, despite many heroic efforts by workers and their unions, appears to be winning the class war. Unions need to change. I believe that organized labor, like political democracy, will need to coordinate much better globally to contribute at a significant level, and the sooner, the better. To be taken seriously, we must challenge the heart of corporate power – unchecked control over who works, who doesn’t, and on what terms. Globalization is much harder for organizations like labor unions that rely on communication from the bottom up, than for top-down corporate command structures, but workers of the world, unite! is still the path to justice. More fundamentally, the great economic and political power capital has gained through global operations means that general political opinion in particular countries – liberal, conservative, labor — is not terribly important. This is because democracies speak mostly for particular populations, but everyone wants the jobs that global corporations control. In the early stages of globalization, many manufacturing workers in developing countries were made redundant. As their incomes fell, retail bottom-feeders like Walmart rose, and resentment rose as well, not only against the rich, but against more fortunate workers. Tax revenues declined, harming public employees. Meanwhile, the vast corporate wealth derived from buying labor from the lowest-wage countries, and selling products to the most advanced, buys political influence wherever it goes. In a 1981 article on bargaining, authors Samuel Bachrach and Edward Lawler[i] defined power in a way that is useful for understanding our current situation. Power in ongoing relationships, they argue, is a function of need. Party A’s power depends entirely on Party B’s need for A or something A controls. If B needs nothing from A, A has no power over B, regardless of any intrinsic strength. If B needs A – or something A controls — more than A needs B, A dominates. In general, the side that needs the other side less in a relationship has more power (whether for good or ill). Let’s consider how this has played out in reality for one global corporation. Otellini complains as well about lack of U.S. investment in technical higher education. “As a citizen, I hate it. As a global employer, I have the luxury of hiring the best engineers anywhere on earth. 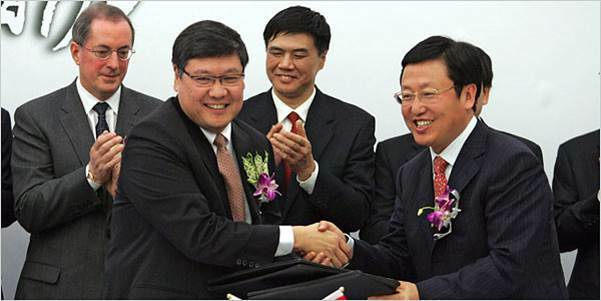 If I can’t get them out of M.I.T., I’ll get them out of Tsing Hua” — Beijing’s M.I.T. The irony of pleading for lower U.S. taxes while calling for increased investment in education escapes Otellini, and Friedman. Yet increasing corporate tax immunity is a primary factor in layoffs and wage reductions for state employees and deficit spending at the Federal level. In the months following opening of the plant in China, Intel spokespersons, through the media — and no doubt in conversations with public officials — consistently made the pitch for lower taxes. And in fact, after the China plant went online, Intel in 2011 announced its next new plant, a $5 billion investment at an existing Intel “campus” in Chandler, Arizona. The announcement followed a tour of the facilities by President Obama. [iii] What were the terms for the new investment? Evidently, Arizona’s need for jobs was greater than Intel’s need for Arizona’s workers. That is, Intel had more power (but still some need). Arizona felt it had to be extra creative, if not extra-legal, in providing tax-free “foreign trade zone” status to a U.S. company in America. Net results of the ability of corporations to locate, move or terminate jobs virtually at will around the globe include lower taxes and greater power for corporations, vis-à-vis workers, governments and citizens. The shift of power from public to private interests over the past fifty or so years has led to growing class inequality in the U.S. and globally, and to the shrinking ability of many governments to provide public services. American readers of a certain age may recall being told by government and media spokespersons in the ‘60s, ‘70s and ‘80s that, of course, only “low-skill” jobs like garment assembly would be allowed to leave the country. “Higher” skilled jobs like auto assembly – and certainly computers — would remain in America. You may also remember Walmart metastasizing continuously in the same years, owing in part to its “Made in USA” image (soon jettisoned for all-third-world production); or patriotic Intel CEO Andy Grove, an immigrant, committed in his day to domestic employment. Times changed. Power shifted. What was unthinkable in 1955 was unquestionable 50 years later. U.S. workers needed jobs, but U.S. owners needed U.S. workers less and less. 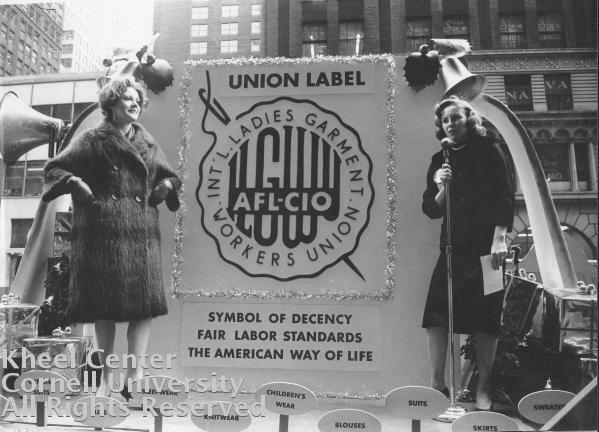 The response of my union, the International Ladies’ Garment Workers’ Union, then UNITE (later UNITE HERE) to this crisis was similar to that of most other unions: we represented particular workers, and tried to defend their interests. We demanded regulation and limitation of imports. Our theme song, “Look for the Union Label” was a hit. But the import tide was undeterred. Though we had been fairly successful at following corporate runaways a nd contractors domestically – we were even able, domestically, to hold manufacturers financially responsible for their U.S. contractors’ employees[v] — we never found the way to follow when they contracted across national borders. [vi] National cultures and national laws were different. Nationalism and “us vs. them” were and are deeply embedded. Other unions and industries followed the same pattern. The shared power, the checks and balances formerly applied by non-corporate domestic stakeholders disappeared into history. As GM spokesman Greg Martin told a Congressional committee in 2007, “We’re a global car company that happens to be based in the United States.”[vii] In other words, the services of US industrial workers were helpful, but no longer needed. By the time Koch-funded Republican Scott Walker made his move against collective bargaining rights of public employees in 2011, the demolition by global outsourcing of manufacturing jobs and unions had been under way for five decades. Corporate wealth and power had multiplied, while the solidarity – and disposable income — of a 93% non-union private sector was diminished. “What happens if America loses its unions?”[viii] Washington Post columnist Harold Meyerson asked, and the question cannot be dismissed. What can be done? Contributors to this blog have made excellent proposals. To inspire great struggles, all agree, we need great dreams. We need a revival of strikes that actually shut down production. But shutting down production today may mean coordinating with the new global centers of production. Racism and anti-communism, were used to divide the working class and block organizing in the South and Southwest in the 1930s and 1940s, and were key to reversing labor progress in the mid-20th century. But authoritarian socialism, as applied by Stalin, Mao – and Castro – failed to deliver workers a better world, and should not now divide us again. A national campaign to demand “just cause” for firings in ALL workplaces would help build a class movement, not just an interest group. But one big dream that is already ON the agenda of workers and activists in many parts of the world is global democracy and global democratic unionism. If not globally, how else can labor seriously address issues with Apple, Wal-Mart, Intel, Hyatt, Exxon, the World Trade Organization – or world health, world peace, the rights of women, the needs of the environment? The challenges that stopped the unions from following capital as it took over the globe in the late 20th century still apply, to be sure, but at a less crippling level. Nationalism, tribalism, vastly different political and labor structures and traditions will no doubt be with us in some form when the 22nd century arrives. But as capital moves to consolidate its global monopoly, and as workers cross every border to find employment – worker organizing cannot freeze in a 20th century national template. The Steelworkers, U.E., CWA and other unions, in fact, ARE already seriously building global capability. US LEAP has been incredibly courageous in taking on the assassins of Latin American trade unionists. International Labor Rights Forum has served us all by identifying sweatshop violations and working toward global contracts for humane sourcing. Many other farsighted workers, activists and organizations, operating both inside and outside organized labor, are taking the challenge on. The late Tim Costello, the Teamster intellectual and modest revolutionary and Shanghai law Professor Liu Cheng who worked together to rewrite China’s labor legislation, are examples. Many other Americans have coordinated with activists in China and elsewhere. A global fight for democracy and unionism could broaden labor’s base – and also put working people and their organizations back in alliance with the liberal critics and victims of unrestrained capitalism in all countries — those who should be our allies, and can create majorities. The fight against Coca-Cola capitalism and Exxon excess is our fight, but not ONLY our fight. Global coordination of this kind needs to be a straw in the wind of global change. Workers’ communication networks are global, and actions can be. Labor needs today to take many different steps to demonstrate to capital that we can organize on so large a scale that THEY NEED US once again. They need to know they can run, but they can’t hide. [i] Samuel B. Bacharach and Edward J. Lawler, in “Bargaining: Power, Tactics and Outcomes,” printed in “Bargaining,” Jossey-Bass Publishers, San Francisco, 1981. My summary is a simplification of their theory. [iv] HBO Documentary Films, ©Home Box Office, Inc.
[v] Thanks in part to an exemption from Taft-Hartley and Landrum-Griffin bans on secondary boycott. [vii] Of course, two years later, GM sang a different song, as U.S. and Canadian taxpayers bailed them out. The game is not over. [ix] While it not generally known, the U.S. garment industry exemption from the Taft-Hartley ban on secondary boycotts (allowing the union to strike a garment contractor to organize the manufacturer, or vice versa) is still in effect and probably valid globally — if there was a strong union to use it, according to lawyers who have dealt with the issue. If a fatal factory is not a striking issue, what is?